The decision didn't affect the result of the game as KXIP were already on the mat. Royal Challengers Bangalore (RCB) were absolutely clinical with their execution in the game against Kings XI Punjab (KXIP) and had them on the mat from the word go. Their bowlers rose to the occasion in the most important encounter and skittled them for a meagre total of 88 runs in the 16th over. 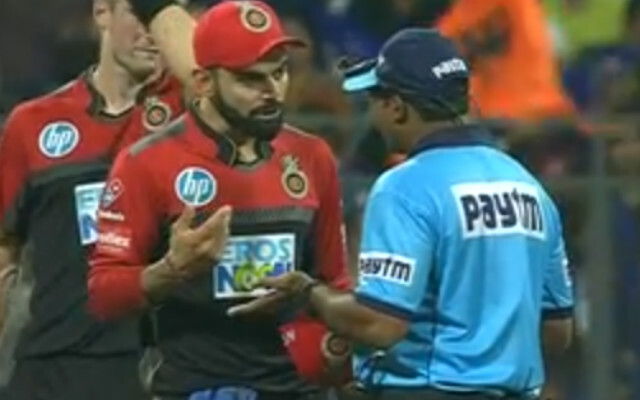 Amidst the game, though there was a confusion which led to the skipper Virat Kohli fuming over the umpires. It was related to the dismissal of Andrew Tye who had taken the DRS after being given out only to withdraw his appeal after a few seconds. The incident happened in the 13th over when Umesh Yadav bowled a short delivery and Tye missed his hoick only to edge it to the wicketkeeper Parthiv Patel who took the catch easily. The umpire also raised his finger and gave the batsman out even as Tye signalled for the DRS by challenging the decision. But surprisingly, after the discussion with his partner Axar Patel, he withdrew his appeal which left Kohli perplexed. He was soon seen in the animated discussion with the umpire and thought that Punjab should’ve lost the review. The ultra-edge had also picked the spike clearly and he was not at all happy with the decision of the umpires. While he was seeking more clearance on the incident which took place in the middle, the on-field officials told him to get on with the game. It seems that Virat Kohli is always in the middle of the action as far as the DRS is concerned. He was at the centre stage during the series against Australia last year when the captain of the visitors Steve Smith had sought help from the dressing room after being given out on the field. Kohli had then gone ahead and called him a ‘cheat’ indirectly in the press conference which had attracted a lot of ire from all the corners of the cricketing world. Twitter Reactions: King Kohli continues his golden run!